Welcome to our site. Most of our people think that there is no needed to update our browser. But There is most of work you can’t do with old version until update your browser. So it is a very important thing. Internet Explorer is a browser which you can get free with windows. This is a great browser. You no need to install any browser to use internet. You can use internet with this browser and also get many facilities. If you’re running Windows 10, you already have Internet Explorer 11. Then there is nothing to worry to get update your internet explorer. You can download Internet Explorer Update version from Microsoft official website. If you want to update your browser automatically then you are at the right place. We can learn from here how can you update your internet explorer. Maybe you heard that Microsoft released a new version of their web browser and you’d like to try it out.You might want to update Internet Explorer for any of several different reasons. Perhaps you’re dealing with a problem with Internet Explorer and other troubleshooting steps haven’t worked. In many cases it would like this you can update Internet Explorer and the problem may go away. As I said you can update Internet Explorer by downloading and installing it from Microsoft or if you want automatically then let’s know…. What is Latest Version ? The name of the latest version of the Internet Explorer is IE11 (Internet Explorer). So what version of Internet Explorer Do you Have? Are you don’t know about your browser version ? Then don’t worry we will give you the solution. Let’s know how can you see your browser and here this is bellow…. Just simply open Internet Explorer. Then click or tap on the gear icon. Click the About Internet Explorer menu item. You can know your browser version from here. You can simply get it by clicking on the gear icon and select the last option about internet explorer. Now it is time to talk about how can you update your internet explorer easily. here you trick bellow…. 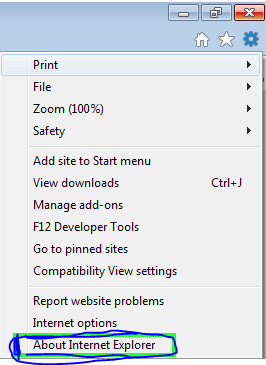 Simply click on the Start icon and search from here Internet Explorer. Check the box next to Install new versions automatically. That’s enough for it. Now your browser will update automatically. Hope you like this trick cause it’s very simple but very valuable thing. You should update your browser to do many great things. Stay with us to get more new tricks.